Por or Para Although the prepositions por and para may both be translated as for in English, they are not interchangeable in most cases. Each word has. 2 Por or Para Although the prepositions por and para may both be translated as for in English, they are not interchangeable in most cases. 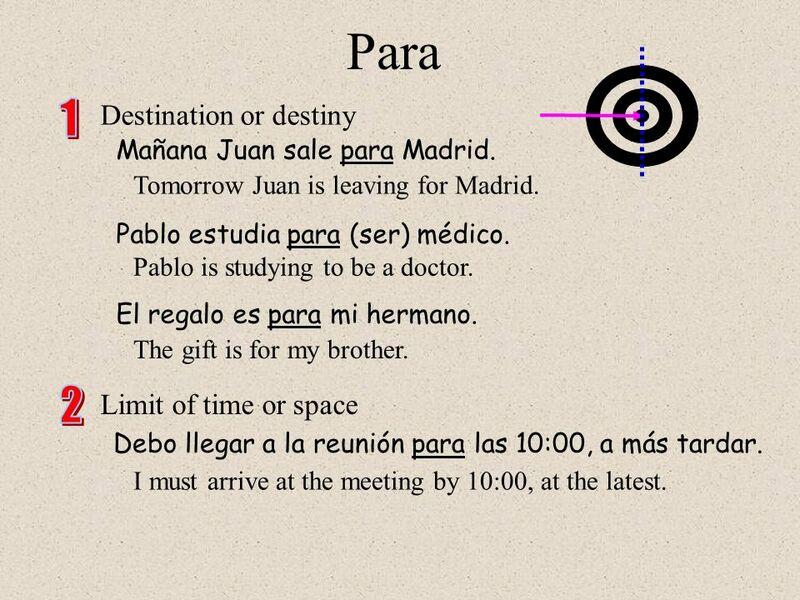 Each word has a distinctly different use in Spanish, as shown in the following slides. 4 Para Destination or destiny Mañana Juan sale para Madrid. Limit of time or space Debo llegar a la reunión para las 10:00, a más tardar. Pablo estudia para (ser) médico. El regalo es para mi hermano. Tomorrow Juan is leaving for Madrid. Pablo is studying to be a doctor. The gift is for my brother. I must arrive at the meeting by 10:00, at the latest. 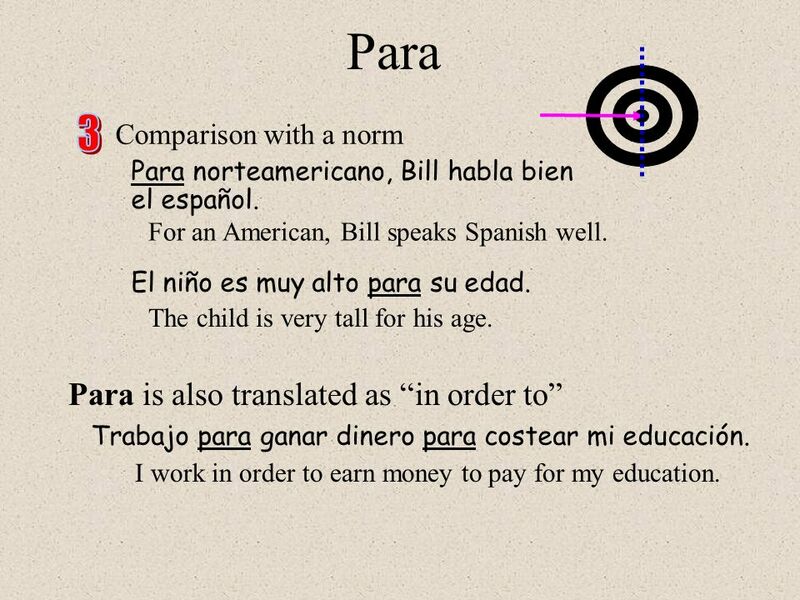 5 Para Comparison with a norm Para norteamericano, Bill habla bien el español. El niño es muy alto para su edad. Para is also translated as in order to Trabajo para ganar dinero para costear mi educación. For an American, Bill speaks Spanish well. The child is very tall for his age. I work in order to earn money to pay for my education. 8 Por Imprecise or approximate direction or time Vamos a pasear por el parque por la tarde. Duration of time Motive or cause Vamos a estar en Cancún por dos semanas. Estudio español por amor al idioma. Were going to take a walk through the park during the afternoon. Were going to be in Cancún for two weeks. I study Spanish because of a love for the language. 9 Por Exchange or interchange Si no puedes ir a la reunión, yo voy por ti. Pagué diez dólares por el CD de Óscar de León. Means or mode Siempre mando mis cartas por avión. Vamos a viajar por tren. If you cant go to the meeting, Ill go in your place. I paid ten dollars for the Óscar de León CD. I always send my letters by air mail. Were going to travel by train. 10 Por Per La velocidad máxima es de 70 millas por hora. Some other uses Estar por + infinitive expresses readiness (to be about to do something Estoy por salir. Estamos por visitar la tumba de Bolívar en el centro de Caracas. I am about to leave. We are about to visit Bolívars tomb in downtown Caracas. The speed limit is 70 miles per hour. 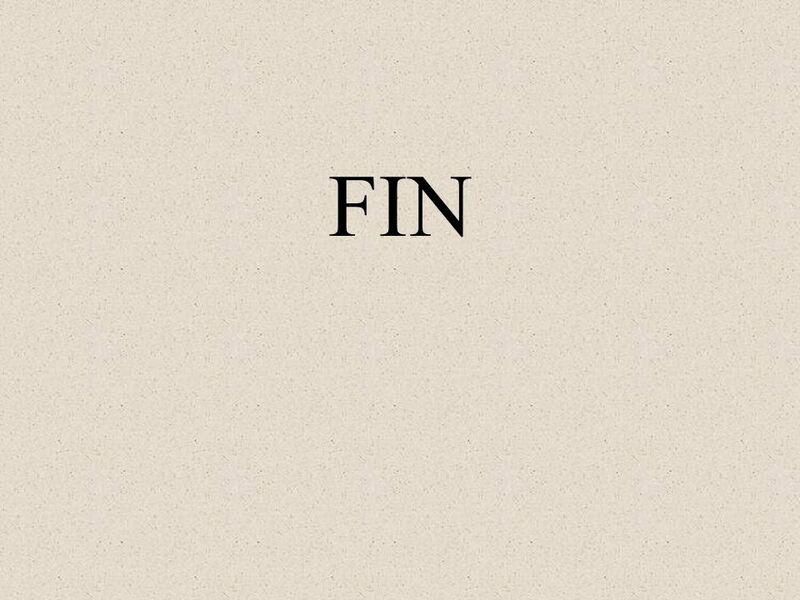 11 Por Que queda por hacer = that remains to be done Tengo dos proyectos por terminar. Some other uses Eso está por verse. Ir por, venir por = to go for, to come for or in search of something or someone El conductor está gravemente herido. Voy por el médico. The driver is gravely injured. Ill go for the doctor. I have two projects yet to be finished. That remains to be seen. 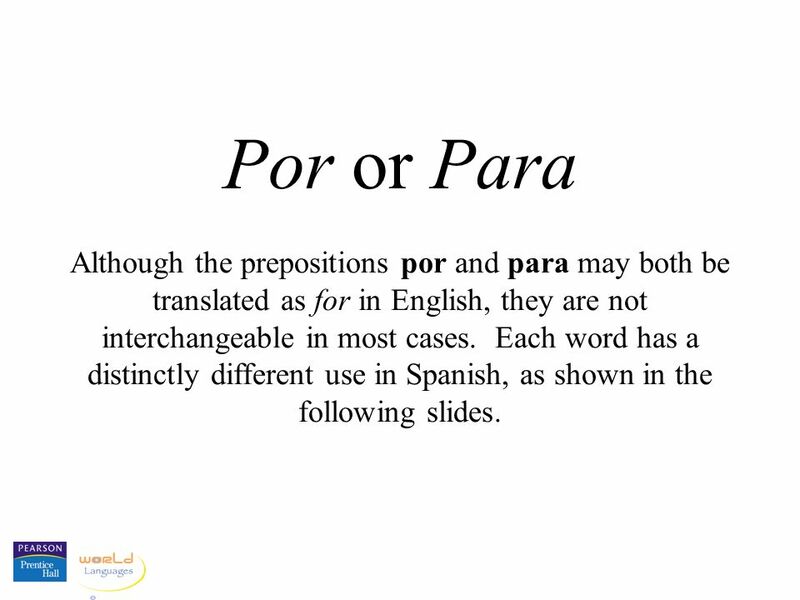 Download ppt "Por or Para Although the prepositions por and para may both be translated as for in English, they are not interchangeable in most cases. Each word has." Por y Para. 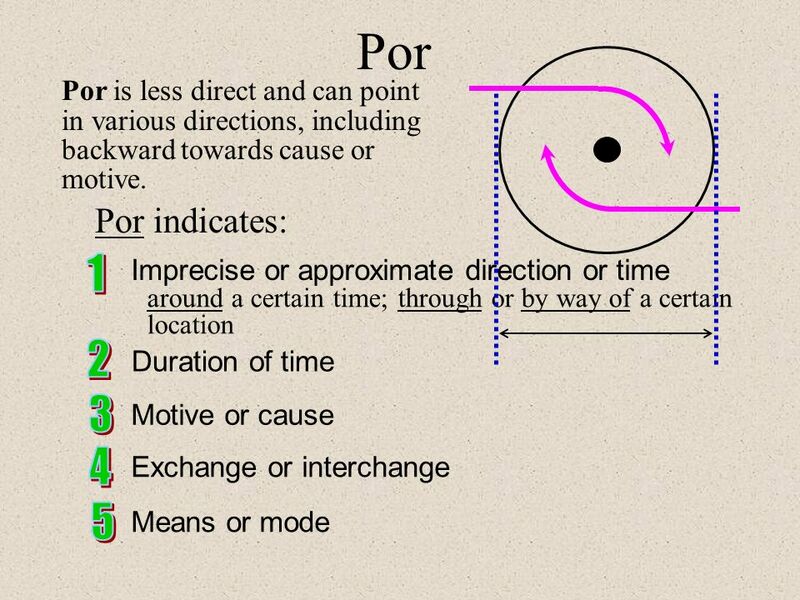 Uses of Por Use POR to indicate movement through, by or to indicate the means and location somewhere in a place (imprecise location) - Camino. Spanish III- IB and Accl. Por and Para. 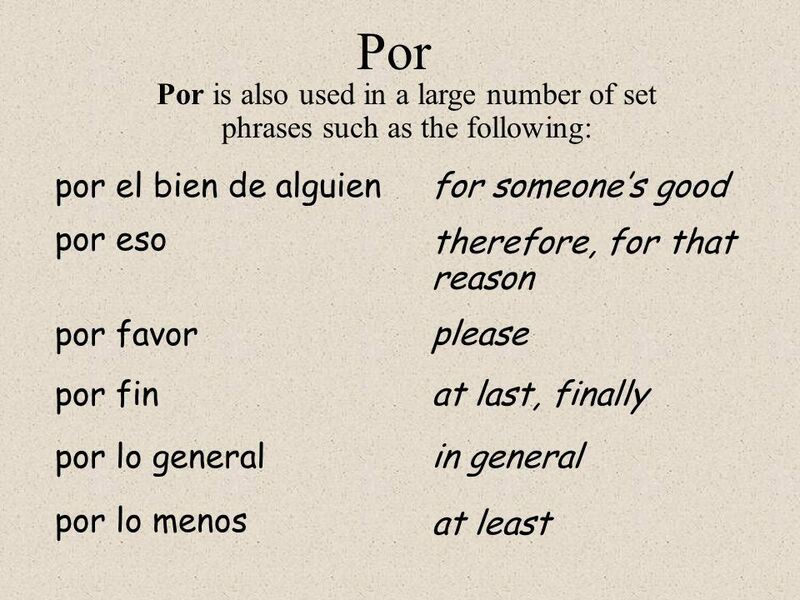 Por y para "Por" and "para" have a variety of meanings, and they are often confused because they can each be translated. Por vs. Para. ¿Cuándo se usa para? Purpose (literally translated to in order to ) Purpose (literally translated to in order to ) Use Use Destination Destination. Saying the date Formula = Es el (number) de (month) Exception = The first of the month is Es el primero de (month) Example = May 5 th Es el cinco de mayo. Por versus Para Pequeñas palabras – grandes problemas. POR vs. PARA Coker College. Por versus Para Las palabras por y para tienen unos sentidos muy específicos en español. Las palabras por y para tienen unos sentidos muy específicos. You use venir to say that someone is coming to a place or an event. “Por” vs. “Para” "Por" and "para" have a variety of meanings, and they are often confused because they can each be translated as "for." Gracias por la. Palabras problemáticas #23. 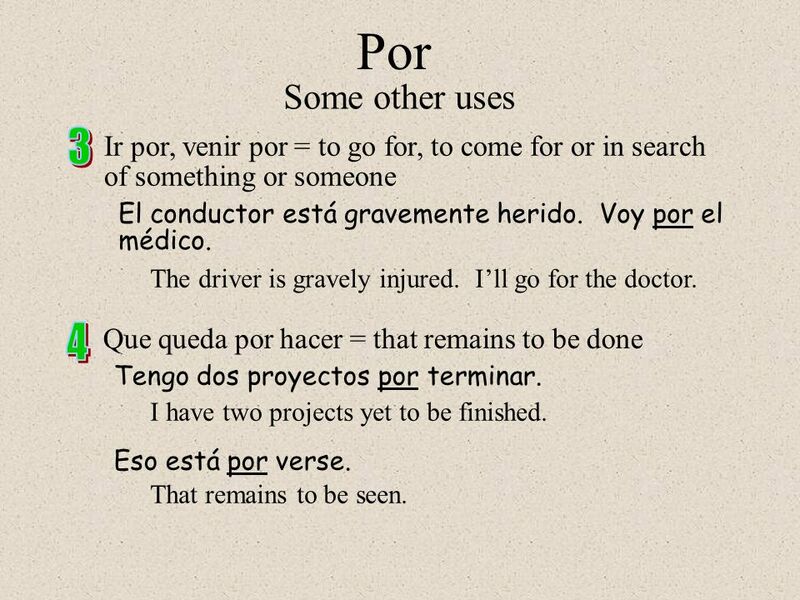 For por para no son sinónimos Actually por/para DONT always translate as FOR--- their use and meanings depends on CONTEXTS. Por vs. Para. 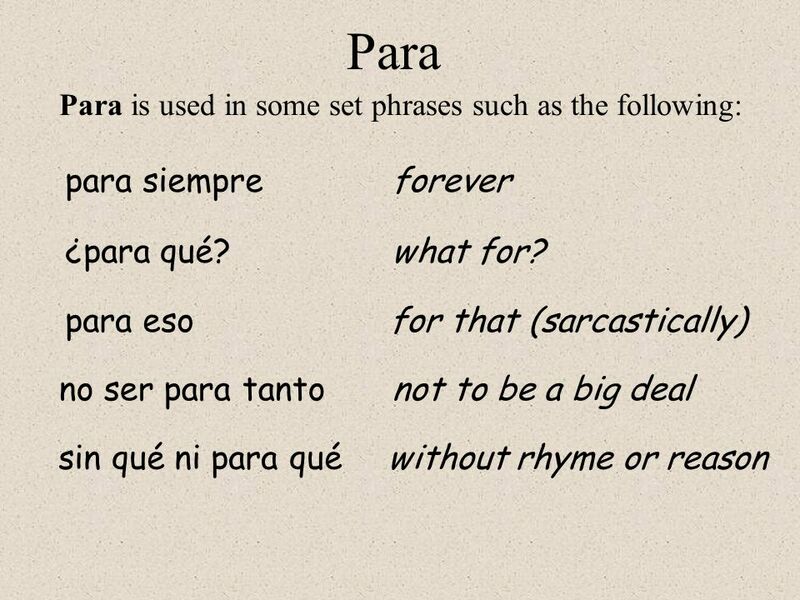 ~ Para ~ Por vs. Para In Spanish, there are TWO words used to say FOR Both por and para mean FOR You must memorize and become familiar. ©2010 Teachers Discovery porpara Learning to use por and para Por y para. 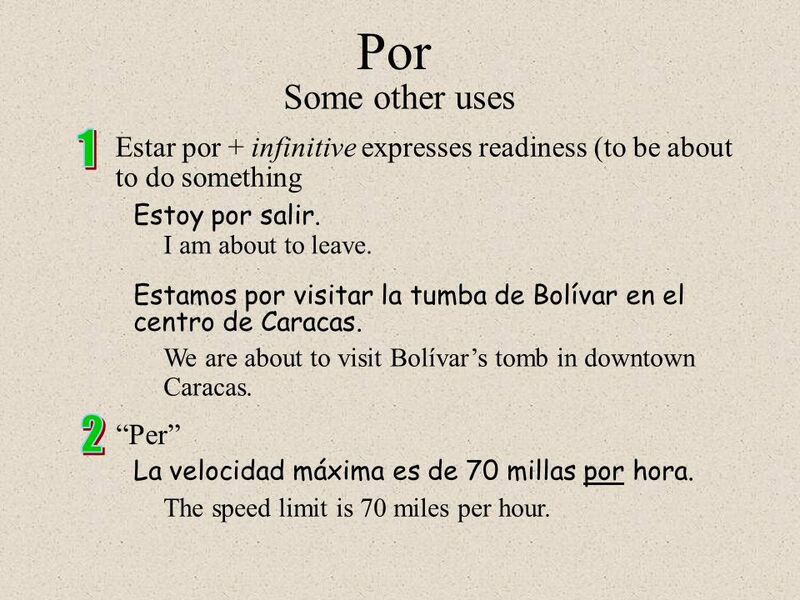 Para vs. Por A comparison of the two words for For vs. For. 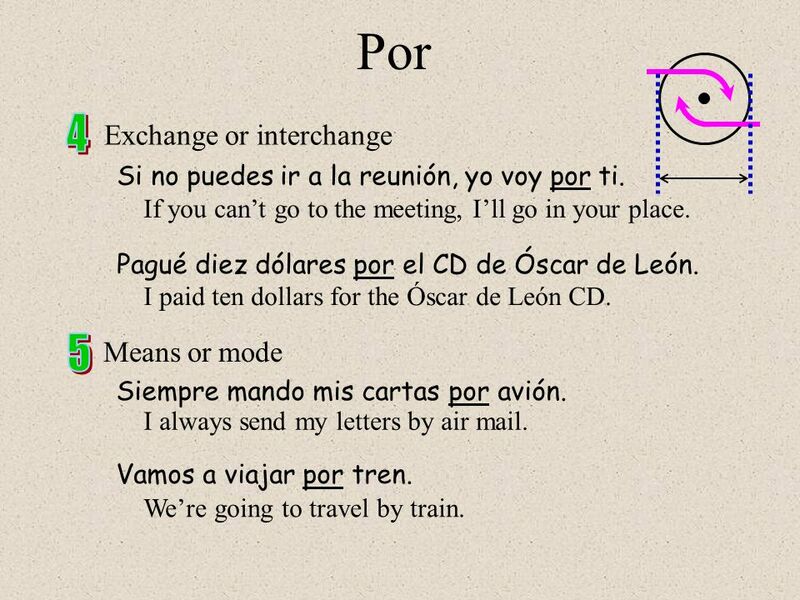 Por y para Por and para can both be translated as for. If you are saying that someone does an action, the verb needs to be conjugated. (ending changed to match the subject) example: Yo estudio mucho para los. Por vs. Para Grammar Cap 4. 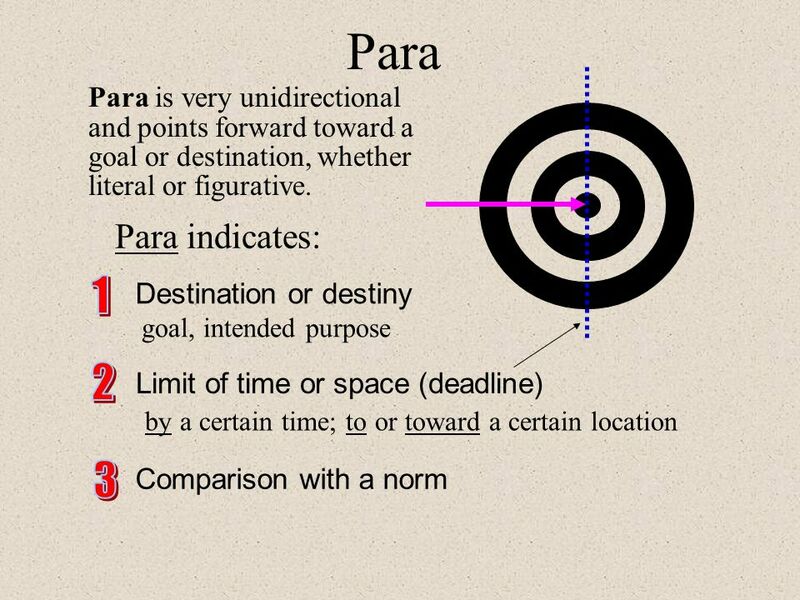 Por and Para have the same meaning in English most of the time. 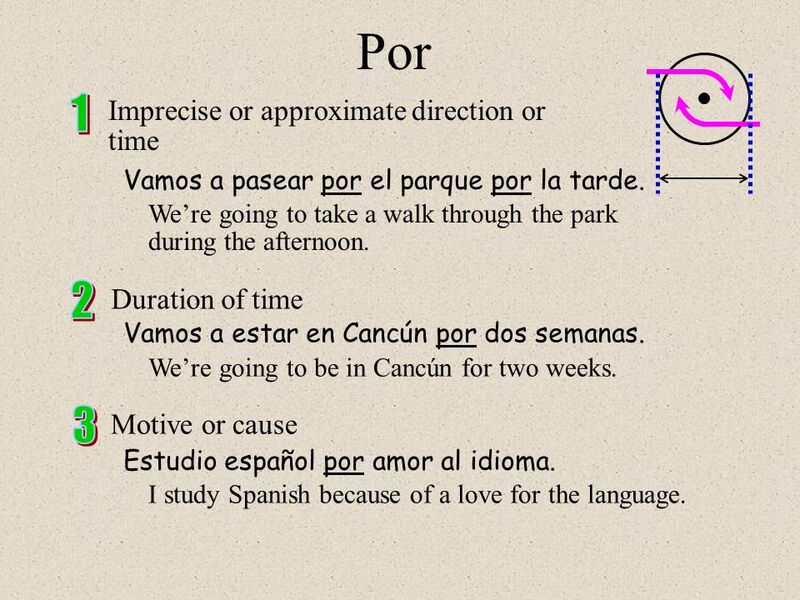 Por and Para can change meanings depending on usage. Por and. Por/Para -Time- -Person- -Place- Duration Deadline, Due Date Instead of, On behalf ofRecipient Along, throughDestination -Reason -Per -By -$ Exchange -By. 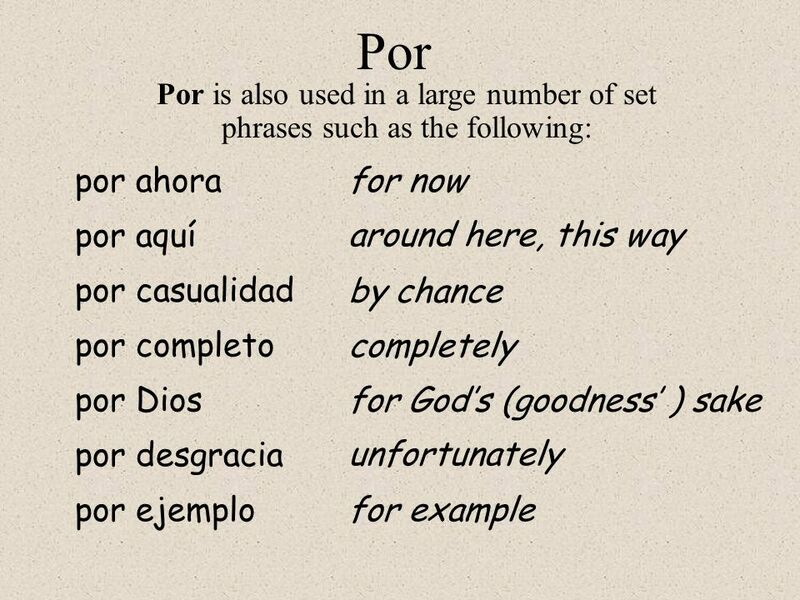 porpara Learning to use por and para Por y para por para The prepositions por and para are often confused because they can both mean for in English. USO POR Y PARA. 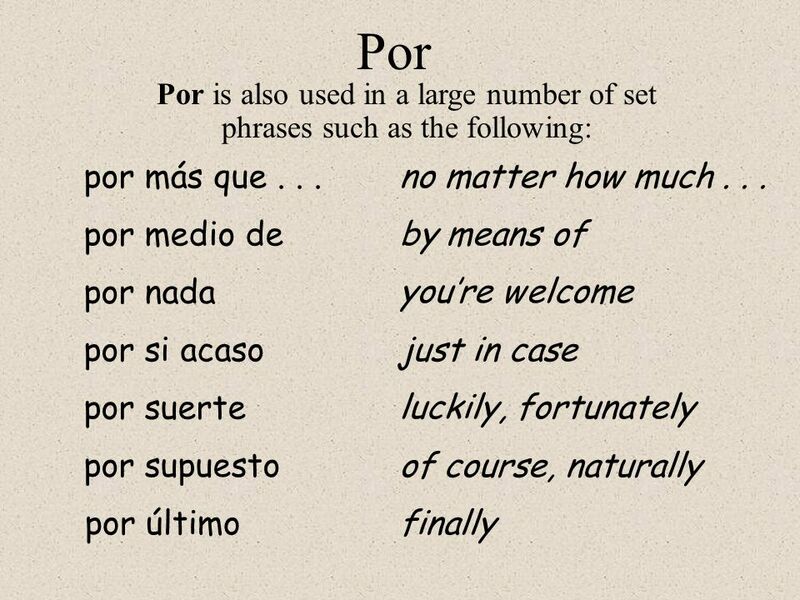 Por and Para have a variety of meanings, and they are often confused because they can each be translated as for Gracias por la informacion.